Having 3 kids close together is so fun! But it can also be a bit overwhelming at times, especially in those early years. Whether I need an extra hand to get things done around the house, or someone to watch the kids so I can run errands, or even just someone who allows for me to finally have some “me time”, I have been fortunate to find amazing babysitters to help us out! 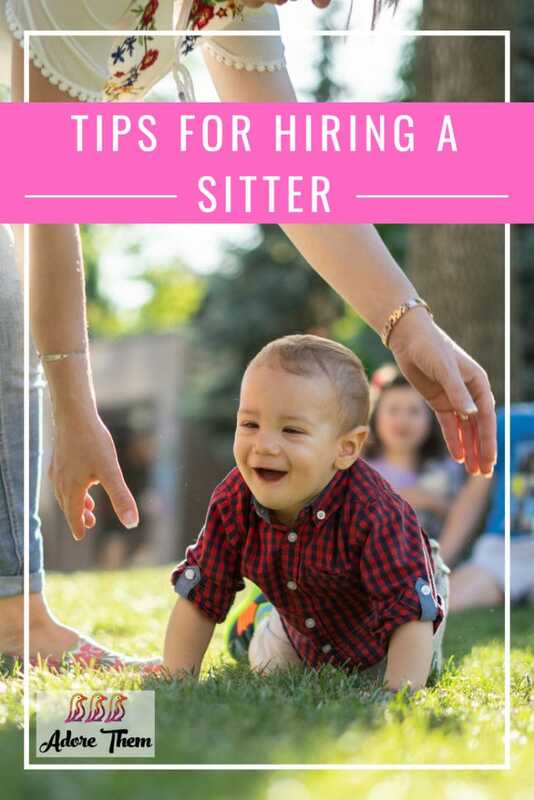 I am often asked a lot of questions around this topic from friends (probably because they know I have the best sitters in town 😉 – “Where do you find your sitters? How do you know who to hire?” And so on….. So here are my tips for hiring someone to help with your children. First, let me say that I love hiring someone I know, or someone that comes personally recommend by someone I trust. But, that is not always an option. And sometimes these friends do not always work out as expected. So I came up with a system to properly vet each candidate, and a couple options when seeking someone outside of family to help out. A few years ago my part-time babysitter took a new full-time job and I was out of family members to call in favors with. So, I decided to try Care.com – an online service to find a new babysitter. A Care.com membership can be expensive, but I have always had amazing luck and never needed more than a month of access. If you are desperate to find good help as I was, a one month fee to a babysitter locating service may seem totally worth it! 1.) Create an Account – I started by making a somewhat vague account and created a general post which stated what I was looking for and listed the ages of my kids. From that post I got over 30 responses. The nice thing was I could fully checkout each of their backgrounds before ever responding. And the background info that the site provides is very extensive. I love that they supply answers to questions that I otherwise would have felt awkward asking someone directly. 2.) Narrow List, Schedule Phone Interview – From here I narrowed down my list from 30 to 10-12 possible candidates. The ones I was interested in I sent a personal message giving a bit more detail of the scope of help I was looking for. Depending on their response I then scheduled a phone interview. 3.) Phone Interview – I used this conversation to ask any questions that I may have had about their profile and ask for more details about their experiences. I tried to also learn a little bit about their interests. Personally I have found that the college age girls attending school for early childhood education, or going to school for something related to nursing/health care tended to be my, and my children’s, favorites. 4.) Narrow List, Schedule In Person Interview – From the phone interviews I narrowed down my search to the top 5 or 6 that stood out to me and scheduled an in-person interview. I liked to do the interviews at my house with my kids around. It amazed me how some of these ladies felt right at home and sat on the floor doing puzzles or games with my kids while we chatted. Then there were others that almost seemed standoffish – which to me was a red-flag. My kids are very shy, and don’t always like when mommy and daddy want to go out for a date night, or when mommy wants to leave to run errands without them. And when I’m home, they often prefer my attention to most others. So I was looking for someone who would take charge and keep their interest. One of my favorite sitters of all time would walk in the door, happily greet everyone, grab my kids hands and ask if they wanted to run outside and play a game – I loved it! There was no standing at the door watching me leave and crying from the window, because they were already laughing and playing in the back lawn! And this spared me the “Mom Guilt” of wanting to have some fun or alone time. Plus, if I had her over to play with the kids so that I could get work done, she was fully capable of keeping their attention and distracting them so that I could focus on what I needed to do around the house. 5.) Schedule a Trial Run – After my in-person interviews, I would then schedule a trial run. I would invite the sitter over for about 2-3 hours with me being home. I tried to use this time to do laundry and work around the house. I wanted to see how they really interacted with my kids, what games and activities they would suggest, how my kids responded to and liked this person, and see how they handled being fully in charge. After the trial run, it was very clear to me who had the talent I was looking for. I forgot to mention my dogs – I have 4 of them. So juggling 3 kids and 4 dogs is a hard task that not everyone is cut out for. So the chosen candidate really needed to be someone special that had a love for kids and animals! 6.) Hire – From this process I often hired someone for a more scheduled role, and kept a few contacts that I could call for the occasional date night (having a list of more than one babysitter is wonderful). Once hired, I always scheduled their first babysitting job for just a couple of hours while my husband and I would go down the street to a nearby restaurant for dinner. From there I would slowly increase each babysitting job by a couple of hours until I felt they were comfortable handling longer shifts, or all day if needed. When my children were babies, I had taped to the inside of kitchen cabinet doors all of their feeding instructions and medication dosages. I had a list of emergency contact numbers by the phone incase I was ever somewhere that limited my cell service. And I always had figured out ahead of time meal options, and left extra changes of clothes on the kids beds incase needed. I am a planner. So I probably over-prepared to leave my kids – even if just for a couple of hours. But my goal is always for my babysitters to be able to focus 100% of their attention on the children, and not have to waste time looking for things, preparing meals, or ever leave them trying to figure things out. And by knowing the sitter is fully prepared and capable of runny things at home, I am always able to enjoy my time away much more! I never feel I have to race home either if my plans take longer than expected because I had planned ahead for practically anything. Now, what if I had been referred someone, or wanted to use someone I already knew? I would start with the in-person interview and then follow the rest of the steps. I can tell you a couple of stories where I trusted someone I knew without vetting their babysitting skills. Two different occasions ended up not as I had hoped. They were amazing people with great personalities and friendships, but I did not realize that they had almost no experience watching a baby. Thankfully my kids survived. But it did make things a bit awkward. After these two mistakes, I developed my “system” and never deviated from that since. Check out our free printables for Important Nanny/Babysitter Notes and While You Were Out to use at home.